The budget approved by the Board of Trustees of the Foundation for the year 2019 amounts to 5.3 million euros, with 85.5% of funding coming from the private sector and 14.5% from the public sector . As of 31st December 2017, the Foundation’s net assets amounted to the sum of 31.6 million euros. The Foundation’s income comes from donations by the different individuals and institutions that form part of its Boards of Trustees and Patrons, revenue from its assets and public grants. The total cost of the activities carried out by the Princess of Asturias Foundation amounted to 5.45 million euros in 2017. 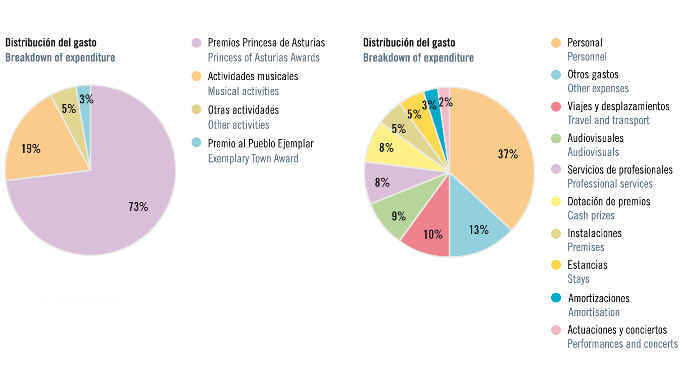 Of the Foundation’s total budget expenditure, 73% went to the call for nominations and the granting and presenting of the Princess of Asturias Awards. The remaining 27% went to other undertakings, primarily musical in nature, to the Exemplary Town of Asturias Award and to other types of non-recurring activities.